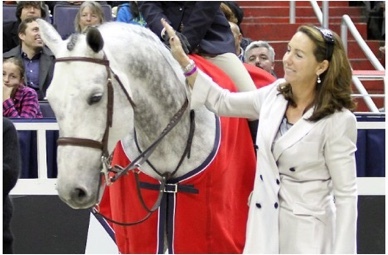 Stacia Klein Madden, Owner and Head Trainer at Beacon Hill Show Stables, is one of the most prominent and successful equitation trainers in North America. 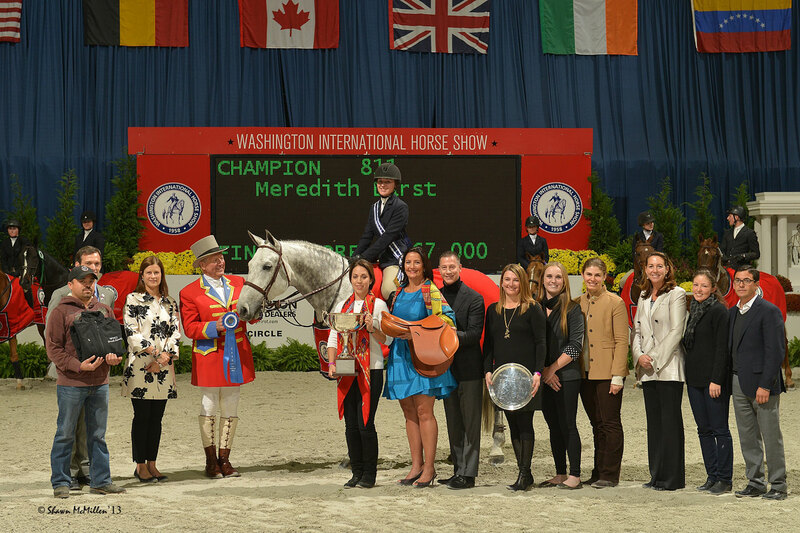 She has seen and experienced just about every aspect of the horse show industry throughout her extensive career, from rider to trainer to clinician. She is widely acclaimed for her ability to turn young, raw talent into international champions. Stacia Klein Madden congratulating student, Elizabeth Benson, on her 2012 WIHS Equitation Finals win. We are proud to welcome Stacia as the clinician for the 2019 Barn Night Clinic, awarded to the barn with the winning video. “I am looking forward to bringing a focus on the equitation to the clinic. I love the experience of working with new people, seeing some grassroots talent, and meeting new horses.” Stacia Klein Madden. Q: How did you make the transition from professional rider to professional trainer? A: It all started when the business started growing rapidly. I was riding, showing, and managing a full-time business simultaneously. I made a conscious decision to focus on the growing business, feeling fortunate and fulfilled with my riding accomplishments. Once I started focusing on teaching, I didn’t realize how much training and teaching would become a new passion of mine. Q: Is there another trainer or person in your life that influenced how you teach your own students? A: For Sure! Valerie Renihan, my first trainer, was instrumental in developing my own teaching style. I also attended a lot of George Morris’ clinics as a child at my home farm, Grand View Stables. Overall, I learned to keep my eyes open and my mouth shut. John and Beezie Madden were instrumental in teaching me strategy, goal setting, and planning the year ahead. A: I hope so! I feel inspired by the hopes and dreams that young riders have. Part of my reward as a trainer is the pleasure of watching them grow. My passion is bringing young riders to the top of their level. But, it isn’t just about show jumping. I have enjoyed watching students that went down other paths and shattered collegiate records. It’s really all about their dreams. Equitation means good riding, and that can take young riders places they aspire to go. 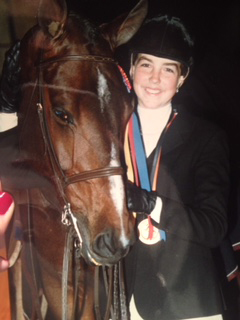 Stacia Klein Madden's first WIHS Equitation Champion, Brianne Goutal, in 2004. Q: What is your formula for developing some of the greatest riders in the sport today? A: My system has evolved. The training process starts out with the basic fundamentals of riding that are the same for everyone. My main goal is to teach my riders independence and confidence, as well as give them knowledge. I know when my riders are ready to move to the next level of competition that they have the tools to do so. I so enjoy watching riders careers as they evolve. 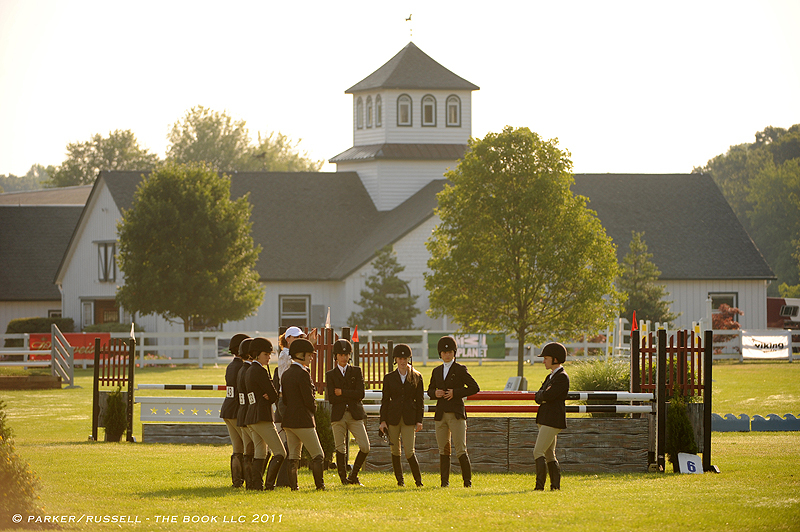 Q: What can young riders incorporate into their training to help them stand out against the competition? A: I see young riders putting an extraordinary amount of pressure on themselves to do good things for their coaches. My philosophy is that it is not just about winning ribbons. Riding is about becoming a better equestrian, a better person, and building a better bond with your animal. You’re not putting ribbons on the tack room. I don’t want my riders to feel disappointed when they have a bad day, I want them to learn. Some of the greatest lessons learned are in the hardest moments of a young rider’s career. It is in these moments when they can improve the most. In a sport where so many things are out of your control you have to take control over the aspects of the sport that you can control. Great riders have to be organized, disciplined, and passionate. Q: What separates good riders from great riders? A: Passion is really, really important. There is a lot of talent in the world, and there is no shortage in show jumping. To go to the next level it takes hard work, dedication, perseverance, and passion, but to be great you have to have the support of people behind you. You have to earn it! Madden grew up in Carmel, Ind., and was originally drawn to horses during a family vacation to a dude ranch. She began taking pony and sleigh rides at a friend’s stable and the passion was born. Once her parents recognized her undeniable connection with horses, they enrolled her in a formal lesson program at the local Grand View Stable. Later when it was clear her horse phase was here to stay, they purchased Three’s Company, a $400 pony that introduced the young Stacia to showing, and solidified and fostered her passion for the bond between horse and rider that Madden is now known for. Young Stacia Klein Madden, winner of the 1987 ASPCA Maclay Finals at Madison Square Garden (NYC) aboard "Outrageous." Madden began her equestrian journey like many in the sport: a self-proclaimed “barn rat,” who was happy with hay in her hair and dirt on her boots. She acted on her dreams when she launched her career as a junior rider winning the 1987 ASPCA Maclay Finals and turned pro only a year later as she trained out of Beacon Hill Show Stables in North Salem, N.Y. After Beacon Hill moved to Colts Neck, N.J. she went on to compete successfully in both the hunter and jumper rings of America’s most prestigious shows such as The Devon Horse Show, Winter Equestrian Festival, and Washington International Horse Show. She began to train young prospects while continuing to show, but soon made the transition from professional rider to full-time professional trainer. Starting out, Madden was unaware of how strong her passion would grow for teaching and developing young riders. Stacia Klein Madden giving last minute tips to her students at Beacon Hill Show Stables ©Parker/Russell Photography.